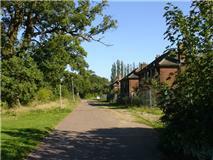 Yesterday, I walked down Copeman Road in Little Plumstead. It is a pleasant road with trees and a row of nicely spaced houses. ‘A very desirable place to live’, you might think, until you realise that seven houses are empty of inhabitants and have been left to fall into decay and ruin. I was told that they have been like that for about eight years. This is at a time when we are being told by Norfolk County Council (NCC) and Broadland District Council (BDC) that the need for houses is currently so great and so urgent that we must cover the North East Triangle of Norwich in 10,000 or more new homes. It is then hard to see why the houses in Copeman Road are being left wantonly to decay. These houses were well-built council houses, whose infrastructure is still sound and which could be repaired and brought up to current standards for much less than the cost of building new houses. However, a developer might not see it like that: there’s not enough profit to be made in refurbishing houses that are well spaced and have good-sized rear gardens. The real money lies in demolishing them and building as many houses per hectare as possible. The empty houses in Copeman Road are just begging to welcome families again. And they are not the only empty buildings in the Norwich region. In Norwich city itself office blocks stand empty and deteriorating. The Norwich Evening News ran a feature on 24 December, saying that the “empty sites are ghosts of our city’s past” – in which, apart from one or two houses of historic interest like Howard House in Kings Street, the recommendation was that the houses and office blocks should be demolished to make way for new development. It is rarely argued that some buildings could be converted into flats for human habitation. One of the sites mentioned was Sovereign House, which overlooks (one might say ‘overhangs’) Anglia Square. I worked in Sovereign House for years when it was Her Majesty’s Stationery Office and employed about 800 people there. Would it not be possible to convert this building into flats? The infrastructure of roads, transport, energy and water are already laid on. Another huge, almost empty office block in the same area– Gildengate House – has also received permission from Norwich City Council to be demolished. These are just a few of the empty buildings in Norwich. It surely makes more sense to make use of existing empty buildings in the city, where transport and jobs are accessible, than to encourage people to settle in new houses on the fringes of the city where they will have to travel into Norwich for jobs - even though there is no satisfactory public transport system to support them? It will encourage the further use of the private car in an era of climate change and diminishing oil reserves. Yet there is a marked reluctance amongst developers to take on an empty building and refurbish it as a dwelling. 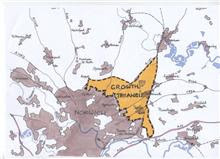 They prefer to work with ‘greenfield sites’ such as the Thorpe Woodlands in the developer’s ‘triangle’ to the north–east of Norwich. There are plans to build between 600 and 800 houses over the woodlands of Belmore, Racecourse and Brown plantations near the garden village of Thorpe End. This is yet another case of a developer wishing to clear perfectly healthy and environmentally valuable woodland in order to build houses – and this is at a time when we are being urged to plant more trees for the future. The respected naturalist and author, Richard Mabey, said of this proposed development: ‘the loss of such a large area of semi-mature woodland would significantly damage our attempts to reduce atmospheric carbon dioxide. The government has stressed the importance of trees in sequestering carbon, and is committed to increasing our forest cover, not encouraging its depletion for development. When the woodland in question is also valuable as a biodiversity reservoir the threat is doubly worrying’. The Friends of Thorpe Woodlands has been formed to fight the threat and they have the support of local councillors, local people and conservation bodies. These three woods are contiguous and although they have been called ‘plantations’ they are far from being full of conifers as the title suggests. In fact they are largely made up of semi-natural broadleaved species with an impressive array of ecological diversity. This fact has been recognised by the Norfolk Wildlife Trust who have had all three woodlands designated as ‘County Wildlife Sites’. Together they form the largest area of woodland within several miles of Norwich and boast a large selection of animal and plant life, including red deer, sparrow hawks, nightingales, and the white admiral butterfly. Many of the oaks, beeches, and sweet chestnuts found in the woods are between 100 and 150 years old. So what is going on? The answer was plain to see in the three weeks plus of the Examination-in-Public (EiP) into the Joint Core Strategy (JCS) of the Greater Norwich Development Partnership (GNDP) last month. The debate was not whether material growth and development should happen – merely where and how it would happen. As long as material growth remains a given by our overgrown human species on an already over-exploited planet, our future as a species (and that of many other species too) remains very doubtful. In the wake of the very tenuous ‘success’ of the just-concluded Cancun climate conference (see liberalconspiracy.org/2010/12/15/why-climate-talks-in-cancun-failed-miserably/), it is more important than ever to think about why the human race seems to be failing so miserably to address this existential challenge to civilisation on Earth. I have a suggestion as to why, and a suggestion as to what we can do about it. Even now, after many visits to Nepal, it seems strange to think that I am now six hours ‘ahead’ of you in Britain. Of course it doesn’t mean that I can experience things before you do – except the sun rising and the progress of the day in hours. I cant tell you what will happen to you, so we are not in the future here in any sense, just in a different place, as the Earth spins around itself and travels around the sun. But it does give one a different perspective on things. And yet, now I'm here, it seems the most familiar place in the world, no longer exotic or strange, just by the very fact that Im here. In the same way, it is odd and in many ways comforting how rapidly one adapts to local situations, as well as to local time –although there is always a sort of social ‘jet lag’ as well as one associated with travel and time change. In part, this is because people’s concerns, although in some ways very different, are also very much the same: birth, marriage, death and taxes, as they say. Although of course the news here is different - and people are certainly concerned about the inconclusive nature of the recent national conference of the largest political party, the Maoist United Communist Party of Nepal, and the failure of the interim Legislative-Assembly yet again to elect a Prime Minister (that makes 16 times), the hike in petrol and oil prices by the National Oil Corporation, the uncertain nature of the electrical power supply, and the fact that Nepal only managed to secure one medal in the recent Asian Games - every-day life contains pretty much the same challenges as one does ‘at home’ in Britain. People are worried about exams, their job, unemployment, being ill, growing old, being unappreciated, and so on. Of course, the average per capita income of Nepal is around 100 times less than that of Britain and our conception of poverty is very different from that in Nepal; life in the rural areas here in particular is really very different from that in the UK, and much, much harder. But, strikingly, there is now remarkably little difference in terms of the kind of life led by what we might call the ‘urban middle classes’ here in Nepal and in Britain, largely because the cost of living is so much lower. With it becoming increasingly commonplace for both men and women to have a job, salaries enable many families to enjoy a reasonable apartment or part of a house, to eat well, to have their children in school (often in private schools), to have a TV, motorbike or even a car, and to have money left over and time for leisure activities. And mobile phones are even more common in Kathmandu than in Norwich. 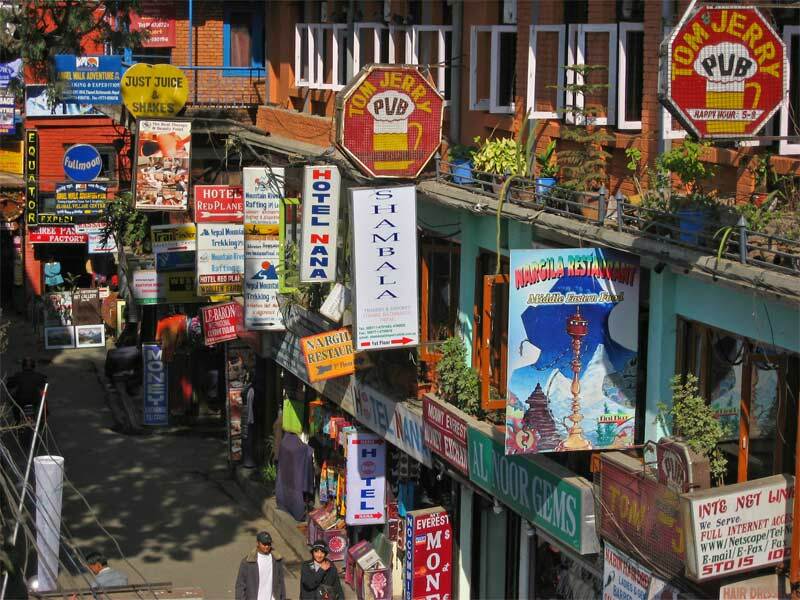 I feel very comfortable here – and of course with the significantly lower cost of living my pounds go a long way, even though the Nepalese rupee has held up well over the years – mainly because my friends live in many ways as well as I do ‘back home’. In many ways, in fact, they live better. 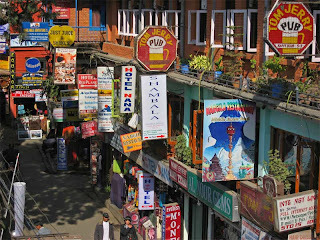 The food is excellent and fresh and largely organic; there are still very few supermarkets or shopping malls in Kathmandu; fuel costs remain surprisingly low and, although there are ‘blackouts’ and ‘load shedding’ (when candles have to be brought out), public transport is very cheap, motorbikes abound and even locals regularly use taxis. There are numerous daily and weekly newspapers (some in English) and good bookshops; there are numerous little cafes and eating houses, all of which are constantly packed out by locals; you can get your shoes repaired for a pittance and a suit made up at a ridiculously low cost. And so on. Much has changed since I first came here in the 1970s; indeed a report by the United Nations this year identified Nepal as one of the countries whose living standards, and particularly whose levels of education and health had improved most in the last 30 years. Of course, that is from a very low starting point and if average per capita income has doubled in that period, it is only from about $250 to $500 a year. Nepal is still one of the ‘least developed’ countries in the world where most people live on less than $1 a day. But things, as they say, are all relative! As I sit here, in the late afternoon sunshine, still warm as the day gradually comes to an end, even in December, sipping a cup of tea from Ilam (in the eastern hills) and looking up at the snow-capped Himalayas, looking forward to dinner with friends (which will cost probably $2 a head), I am also enjoying the thought that, although we are six hours behind the time in Bangkok, we are still six hours ahead of you in Britain. “Divided we fall,” we chorused. There were a thousand of us at least standing beside the bandstand in Chapelfield Gardens, stamping our feet against the bitter cold. The last time I stood here it was a sunny autumn day, and I was listening to a song by Seize the Day dedicated to the striking wind turbine workers on the Isle of Wight. In 2009 at a Zero Carbon concert this had struck me as unusual. Most of the protest songs were about the environment or the war. Now there’s a change of mood in the wintry air. The Great Norfolk Anti-Cuts Demo in Norwich on Saturday marked a social shift, as hundreds of marches and demonstrations break out in Britain’s cities and occupations take place in 30 universities across the country, creating a new ferment and new alliances. The shock tactics of the cuts are a standard part of an economic doctrine that is being administered for the second time in Britain. The present Coalition cabinet have been called the Children of Thatcher and the dismantling of the welfare state is a hallmark of the Friedman School of Economics, widely embraced by the last Conservative government - a deliberate break-up of unionised workforce, privatisation of the public sector and deregulation of the markets to create a society of extreme wealth for the few, corporate control and a vast and voiceless underclass. Only these present cuts are happening in a very different climate in a very different decade. This is no longer the boomtime of the 80s when Britain was able to export oil and gas and the majority of the population could find credit to go on a shopping spree. There is economic collapse in Europe, an unwinnable war in Afghanistan, 388PPM of carbon dioxide in the atmosphere and perhaps more crucially a growing sector of people throughout Britain waking up to the fact that life is not the fossil-fuelled consumer dream they were once promised. The key strategy in the shock doctrine is to keep people separated and unable to communicate. To make changes so quickly and brutally across the board that it is hard to grasp what is happening and retaliate. Confused, isolated and afraid, people give up. However after decades of individualism, different sections of society that have been out of touch with each other are beginning to connect up. I’m walking alongside the fiery-red banner of the Communication Workers, as we swing up Gentleman’s Walk, past the merry-go-round outside the Forum. I’m remembering the last time I joined a march with union banners was in Birmingham in 1976 when I was a student. Can it be that long ago? The Saturday shoppers stop and stare. But they are not divided as once they might have been. As we walk past the fire station the firemen come out and cheer. We’re linking up. We’re joining up the facts in our minds and deciding how to act. We're meeting up as individuals and as groups and coming out of our houses. When this column was cut by the EDP after six years, the six writers did not go their separate ways. We decided to make the OneWorldColumn blog a focal point for all the activities that were taking part in the region; to start a conversation that would not only bring the organisations and disciplines we represented together (Green Party, Greenpeace, the peace movement, Transition movement, Campaign against Climate Change, international development), but to unify all the different strands within the local progressive community. On the bandstand speakers from the public sector unions, the universities and the NGOs were advocating a clear alternative to the cuts that include scrapping Trident, stopping tax evasion, curbing banker’s bonuses, bringing troops home, introducing financial levies and creating a million green jobs and apprenticeships that would enable us to downshift into a low-carbon economy. Cath Elliot, a Guardian blogger, is talking about the huge rise in unemployment for women, how equality has now been dubbed “a dirty word” (You can find her speech on the blog Too Much To Say For Myself). We all know that the 18 millionaires who are in the cabinet are not all in this together with us. That in the choice between people’s welfare or bankers' profit, the latter has been taken. And that knowledge brings a certain sobriety and solidarity within the crowd. None of us seem confused or afraid. I am standing next to a group of deaf people who are watching the speeches being signed by a woman in a white wool hat. “We’ve never had it so bad.” said the slogan. The disabled and those who care for them will perhaps fare the hardest in these cuts. Crucial grants and benefits that make people able to live independent lives as human beings are being taken away. Many are being forced into unsuitable low-paid work. In another era I might not have been able to talk with them. Now we have something in common. We are realising that even though we face a global economic recession, we can come together, reorganise and redistribute amongst ourselves. And in a time of structural collapse, coherence and communication are perhaps the most vital things we can share. Oh, the big society is happening all right. But it may not be the one the Government is banking on.